Reece Morris with his coaches Rod Crozier and Kev Smith. Boston ABC boxers are finding themselves to be in demand, with fighters competing in three events in the space of two days this weekend. On Friday the club was represented at Park Inn, Northampton. Youngster Dylan Harmon was back in action following his good win last week as he stepped up in class against Yousuf Ibrahim, of Northampton ABC. Dylan began the bout cautiously as he tried to establish his jab, which he was able to utilise to good effect. He was having some success in the exchanges as he was starting to get through. Ibrahim, after tasting Harmon’s power, decided he didn’t want to engage in close combat and used his hand and foot speed to good effect to get away from any trouble that was coming his way. It was cat-and-mouse for two rounds with nothing much in it. Going into the final round, a big effort was needed from Dylan, which he duly gave and he took the round. Dylan didn’t get the decision this time out, but he received a lot plaudits from the home crowd and proved that he can mix it at this level. Coby Brown travelled to The Rushcliffe Arena, Nottingham on Saturday afternoon to represent the club in the National Championships. After getting all weighed and ready to box he received a bye and will now fight on Sunday in the East Midlands Regional finals in Leicester. 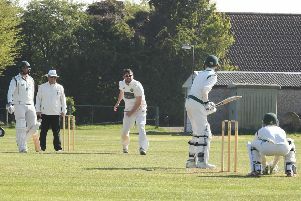 Also on Saturday, the club travelled to Aylsham, Norfolk. In action was Reece Morris in a skills bout, facing Charlie Harris of Aylsham ABC. This was a classic contest in which both fighters displayed good skills with very little intervention needed from the referee. Harris was the taller, long-range boxer, with Reece the shorter in-fighter. Reece gave a very good account of himself and will soon be knocking on the door for his first competitive fight. Also appearing in his debut fight was welterweight Igors Jermol, who was matched against Erik Ruboiwomi of Wisbech ABC. Igors began the bout aggressively as he tried to land his big shots to test the Wisbech man’s resolve. He looked happy to box clever with his straight punches on the back foot. As the rounds wore on, Igors was struggling to find that killer blow he was looking for and the bout was awarded to Ruboiwomi. This was a good lesson for Igors who will learn a lot from this fight.